Coccigrep – To Linux and beyond ! coccigrep is a semantic grep for the C language based on coccinelle. It can be used to find where a given structure is used in code files. coccigrep depends on the spatch program which comes with coccinelle. The source can be accessed via github. See next section, for usage of coccigrep inside Vim or Emacs. Run coccigrep -h for up-to-date and complete list of options. First command will interactively ask you the value. Second one will search all dereference of the datalink attribut for Packet structure. The last one will look where the set operation is done on the datalink attribute of Packet. To get the list of operations on your system, you can run coccigrep -L or look at the list provided when input for operation is asked in interactive mode. The matches will appear in the quickfix list and the file corresponding to first match will be opened at the corresponding line. Note that you can use completion on structure and attribute names based on tags (generated by :make tags). The matches will appear in a buffer with mode set to grep-mode and you will thus be able to jump on occurence. History is available on the different parameters. The operation option could lead to some missed match because the semantic patches used internally may needing some improvement. Please use github to report issue. All ideas are welcome. In fact this is a templatized semantic patch. There is two variables $type and $attribut that will be replaced by the content of the command line option -t and -a. The last constraint about the semantic patch is that there is a position p1 which is used to display the positionnal information about the match. This feature is available since version 1.0-rc5. More information in this mail. Bug report and feature request can be made through Github interface. You can also follow coccigrep activity on Google+. Pingback: Coccigrep, a semantic grep for the C language » To Linux and beyond ! I will continue to investigate to see if there is a cleaner alternative. Is it possible to use Coccigrep upon nesting structures ? and I want to know where “segment” attribute is set ? Would it be possible to use Coccinelle or to expand coccigrep in order to search for non constant static data through a large code base? I don’t really get what you want to do. Could you give an concrete example ? Well, the lead dev of VLC asked on vlc-devel  if somebody would know a way to look for static non constant data throughout the code base, because he discovered such static data in the code and he’s not happy with that (I suppose it’s not a good idea in a multi-threaded environment). Of course the use of static data that is never modified is ok, so it seems not that easy to identify the bad guys. You mean detect static variable and look for where they are set and thus modified ? I’ve found a small bug: if you increment an integer attribute with the operator “++”, this is not detected by the “-set” operation (but it is if you replace “++” by “+= 1”). I can’t seem to find a place to put in bug reports. Thank you Mark. You can open an issue on https://github.com/regit/coccigrep/issues for this bug report. This is link with the fact you are using python 2.5. The delete parameter has appeared in python 2.6. I will try to make a fix. Pingback: What’s new in coccigrep 1.6? » To Linux and beyond ! Config error: Unable to run spatch command ‘spatch’: No such file or directory. Indeed, there is something imo missing in current version: The ability to recurse subdirs (as grep -r)! Thanks a lot for your interest in coccigrep. 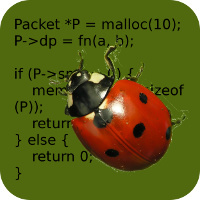 For spatch, you need to install coccinelle which is the semantic tool used by coccigrep. Regarding recursivity, if you give a directory on the command line, coccigrep will select recursively all files inside. Can coccigrep be used to list all used types in a sourcetree ? Handy for determining which autoconf tests I need. No, I don’t think that coccigrep or coccinelle can be used easily to do an enumeration of the types.